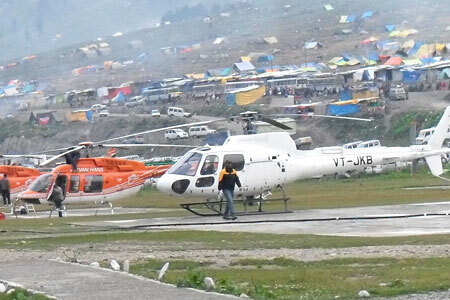 ﻿	Amarnath Yatra Tour Package & Cost by Helicopter – Baltal Valley. The holy ancient books and scriptures describe the Himalayas as the divine abode one of the trinity gods- Lord Shiva. Thus a pilgrimage to the Himalayas and especially to the sacred cave of Amarnath is considered to be a journey to unveil the secret spirit of the Almighty and a path through which salvation of the soul or Atma can be attained. Amarnath Yatra 2017 by Helicopter from Baltal is a well-planned tour package of 3 nights and 4 days that does not only offers you a chance to pay homage to Lord Shiva by visiting the Amarnath cave but also lets you explore the popular attractions in Srinagar. The itinerary also includes stay in a houseboat and a Shikara ride on the very famed Dal Lake. Upon arriving in Srinagar, meet our tour representative who helps you in an assisted transfer to Sonmarg. Check-in at the hotel. The rest of the day is at leisure. Overnight stay. On the 2nd day of the tour, start your day by going on-board the helicopter from Baltal up till Panjtarni Helipad. From here, to go up to the cave you can opt for a Palki ride or can simply back. Explore the holy Amarnath cave, which is around 6 km from Panjtarni. Later, back to Panjtarni. Now take helicopter to go to Baltal. Get transferred to Srinagar by road. Post sumptuous breakfast, leave the comforts of your hotel to explore the major tourist attractions of Srinagar. Enjoy a memorable visit to the world- popular Mughal Gardens including the Nishat Bagh or the garden of pleasure- built by Asif Jha in 1636 and finally Shalimar Bagh or the abode of love- constructed in 1619 by Emperor Jahangir in the memory of his beloved wife Nur Jahan. Conclude your day with the Shikara ride on the placid waters of the Dal Lake (at your own cost). Stay overnight. Post breakfast on the last of your tour get an assisted transfer to the Srinagar airport to board the flight for your onward journey.